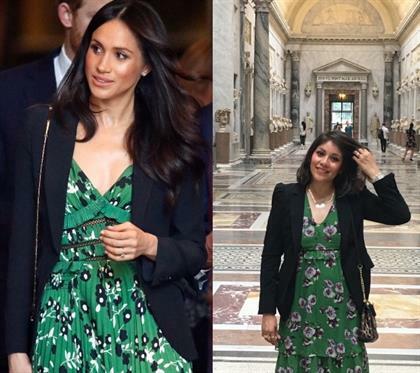 Cape Town - This Meghan fan replicates the duchess’ impeccable fashion choices and shares it on Instagram. Linda Martinez from Mexico City first saw Meghan as her Rachel Zane character in the American hit series, Suits. She soon became a fan of her sophisticated dress sense and was in awe of her own personal backstory and humanitarian work. Since Prince Harry and Meghan announced they were dating in 2016, Linda, who’s also an avid royal watcher, has followed the now pregnant Duchess of Sussex’s wardrobe choices with a close eye. “I’ve always followed the royal family but when I learned about the engagement of Meghan and Harry, I got involved more with Meghan,” said Linda. “I was a Meghan fan because of Suits but when I did my research and I found out about her family and work, and all the things she’s done to get what she has and where she is today, I started to admire her a lot and wanted to be like her. “I wanted to be like her as a human being, she’s an empowered woman and has the most incredible style. “I didn’t have a defined style before and when I realised that I felt confident in the neutral colours, sophisticated combinations and this elegant yet comfortable way to dress I loved it. Linda, a qualified actuary, sometimes shops around for a low-cost alternative or, when her budget allows, snatches up the original piece before it sells out. Incredible pictures show the 31-year-old channelling her inner Meghan whilst emulating the duchess’ Sentaler coat outfit worn to her first ever Christmas church service at Sandringham in 2017. Other images show Linda’s take on the blue and white floral Oscar de la Renta dress the former Suits star wore to the wedding of Princess Diana’s niece, Celia McCorquodale, in June last year as well as her spin on Meghan’s Wimbledon outfit worn to the tennis competition with sister-in-law Catherine. Linda has recreated around 50 of the duchess’ better-known looks and spent up to $15 200 (around R205 200). The fanatic is excited for the royal couple’s baby due this April. “I was so happy for them when they announced the news and I'm quite sure it was their decision to have the baby regardless of what others would say about it,” said Linda. “It’s amazing because she never stopped the royal agenda either. “I love fashion, so I keep my eyes on the low-cost brands because sometimes they have things that are [similar] to Meghan’s outfits. If my budget allows me, I buy the original outfit, if it’s not sold out. “I just want to express my admiration for her by sharing my looks, my travels, what I love and what makes me happy.